Contact: Lucy King, telephone 214-674-7327, king4128@aol.com. 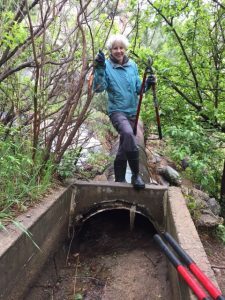 The Ditch currently has 37 Adopt-a-Ditch volunteers and is looking for more. Volunteers choose a specific section as their responsibility. They work with the Ditch Rider to learn how to keep it maintained. Assistance can be either financial or physical. If your assistance is financial, the Ditch hires able young bodies to carry out specific instructions on your section. If you wish, you may be recognized with your name on a sign, or you may remain anonymous. Thank you for participating!